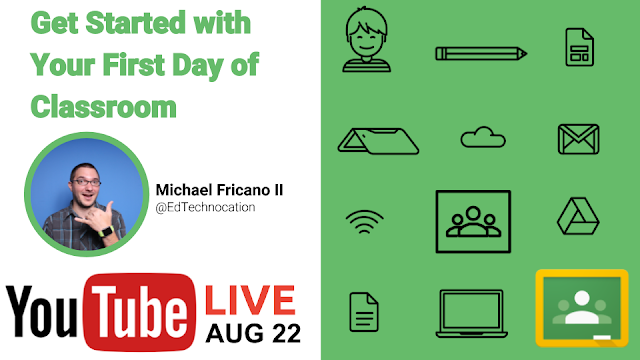 EdTechnocation: YouTube LIVE AUG 22: Get Started with Your First Day of Google Classroom! YouTube LIVE AUG 22: Get Started with Your First Day of Google Classroom! 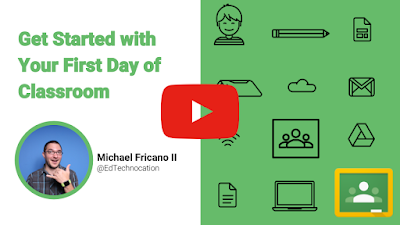 The Google Classroom Team is kicking off the 2017-2018 school year with the #FirstDayofClassroom Campaign! And I'm excited to be a part of it with a YouTube LIVE video on August 22! Continued reading for more details! The 2017-2018 school year is off to an amazing start! I'm seeing so many great posts across all my social media channels of teachers excited to be back with their students and WOW! do I see some #EduAwesome classrooms! The Google Classroom and Education Team wants to ensure that every teacher is successful with G Suite for Education and Google Classroom as we begin the school year! So they're kicking off the #FirstDayofClassroom campaign, along with a brand new Classroom Resource Hub, and a series of YouTube LIVE videos in August and September! Use #FirstDayofClassroom on Twitter to share your favorite tips, tutorials, videos, resources, stories! Join me on August 22 at 12 pm HST! Visit the YouTube page and set a reminder! Add a reminder to your Google Calendar!